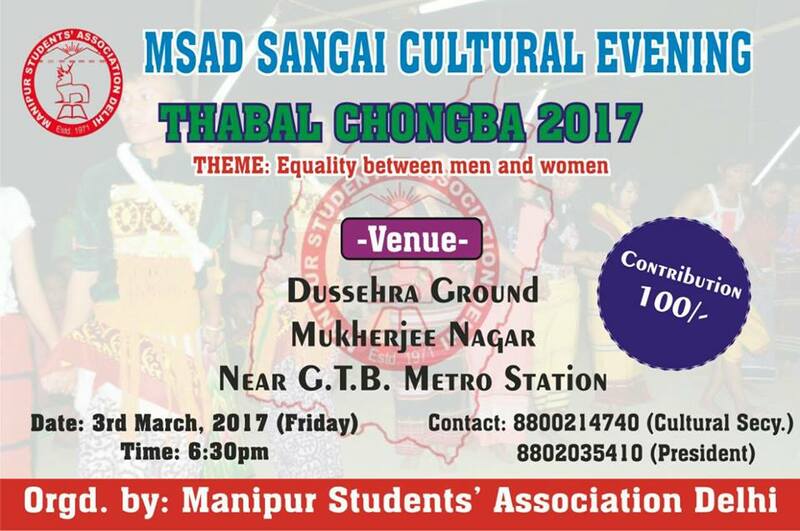 Manipur Students’ Association Delhi (MSAD) would like to draw your kind attention to participate at the Annual Fest “MSAD SANGAI CULTURAL EVENING (THABAL CHONGBA)” which is to be held on Friday, the 3rd March of 2017. The Venue will be Dussehra Ground, Mukherjee Nagar, Near G.T.B. Metro Station, starting from 6:30 pm. The association MSAD is a non-funded, independent students’ body based in Delhi which works for the welfare of Manipuri students and workers in Delhi. The association also has been continuously helping whoever Manipuri coming to Delhi for medical purposes and many more.